Portable WR-2 Spray / Rinse / Sanitize W/ Pistol Grip Gun | Lafferty Equipment Manufacturing, Inc. 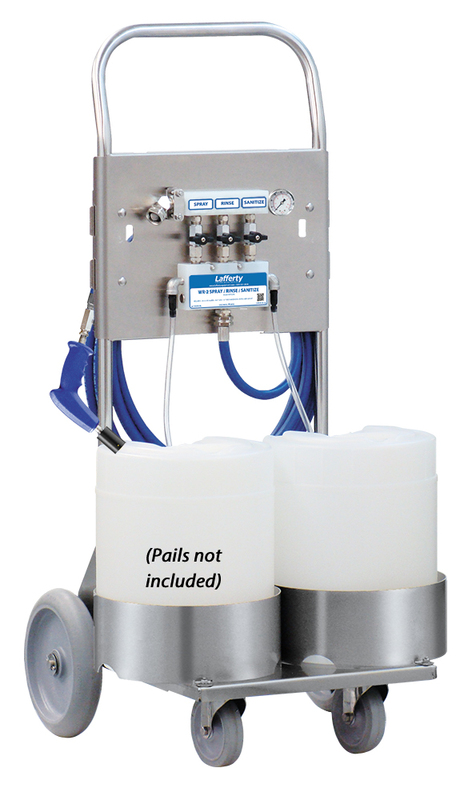 The Portable WR-2 Spray / Rinse / Sanitize System is a combination chemical spray and sanitizer applicator featuring a rinse mode and an all stainless steel cart assembly. This venturi injection system uses standard city water pressure (35 - 125 PSI) to draw and blend chemical concentrates into the water stream to create accurately diluted solutions. The solutions are projected through the discharge hose, pistol grip gun and recessed fan nozzle as a uniform spray.